Unless you are lucky enough to live on a lifestyle block, or have a really good composting system, it is unlikely that you will have anywhere to put your garden rubbish. Crewcut is committed to environmental sustainability in regards to green waste and recycling and we have the solution which is environmentally friendly and easy on your pocket. Our MASSIVE 600 litre garden bags fit in a frame and sit quietly in the corner of your garden. They are perfect for lawn clippings, prunings, small branches, leaves, shrubs, trimmings - anything organic really. Our standard garden bag collection is based on a 4 weekly cycle. We will supply you with a calendar which lets you know the collection week. The best thing is you can skip a collection if your garden bag is empty and we will just collect it the following month. And the good news is if you have been super busy in the garden you can also arrange a mid-collection (prices vary on region) or request two garden bags to be delivered at your next pickup. Prices range from $16 but vary depending on region. The easy way to dispose of green garden waste! How often does my bag get emptied? 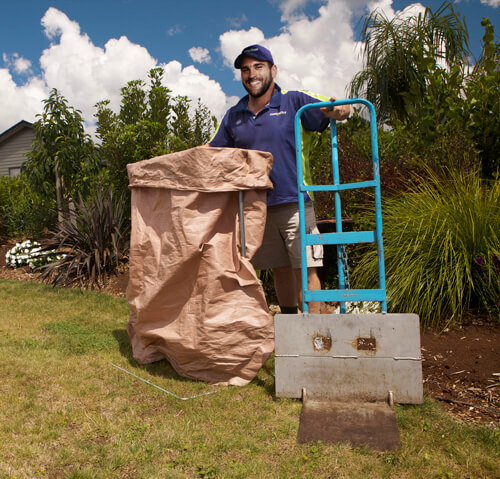 A Crewcut operator will come to collect your garden bag once a month on a regular basis. Your operator will give you a garden bag calendar that has a colour assigned to you for the week you are due to have your bag collected. As long as your bag is accessible for the operator it will be picked up. Yes! The good thing is if you have an empty bag, you can skip a month so you can fill it up for the next collection. Provided you contact the office and advise before Thursday at 4pm the week prior to your collection you will not be charged for the month. What is the size of the garden bags supplied? 600 litres! Which is plenty of room to fit in all your garden waste. Can I call to get the bag emptied earlier? Generally they get collected every 4 weeks, but you may be able to organise an earlier pick-up. To arrange an out of schedule collection, please contact the office before 4pm on the Thursday before the week you want it collected. There will be a $5.00 surcharge on these pick ups.